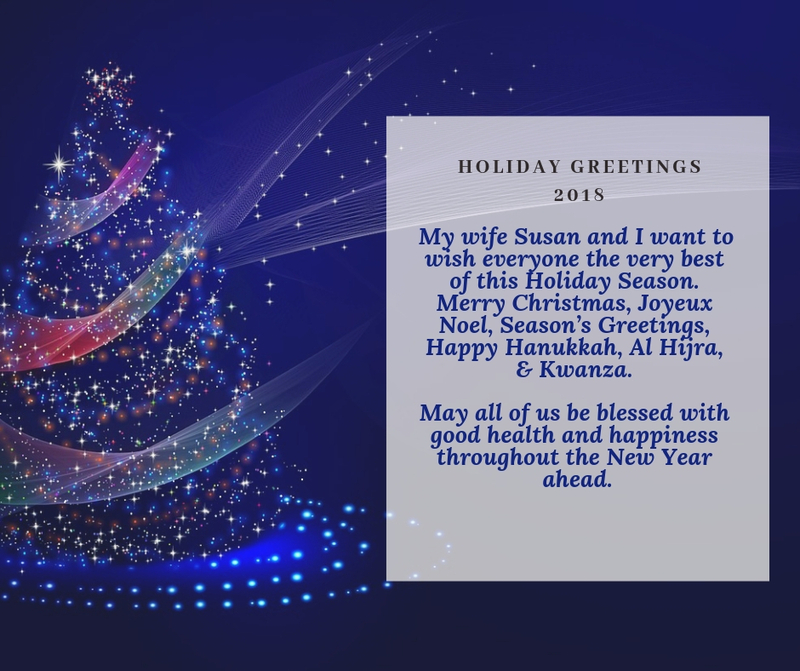 My wife Susan and I want to wish everyone the very best of this Holiday Season. During this joyful time of year there are many types of spiritual and cultural celebrations: Merry Christmas, Joyeux Noel, Season’s Greetings, Happy Hanukkah, Al Hijra, and Kwanza. The message for Peace on Earth and Goodwill to All is universal. Have yourself a blessed time with your families, friends and neighbours. May we all strive for peace, tranquillity and harmony in our daily lives. Remember those who may be less fortunate or are experiencing hardship and despair. Please give to your local food bank, or better yet; give the gift of life and donate blood. May all of us be blessed with good health and happiness throughout the New Year ahead. In alignment with HRM Council’s Priority Outcomes of Public Engagement and Fiscal Responsibility, and to support citizen-centred service delivery, the 2018 Citizen Survey was conducted during August and September 2018. The findings help identify municipal priorities and inform future decisions. The HRM Citizen Survey acts as a gauge of the satisfaction of residents and taxpayers with the services provided by their municipal government, and to help identify the mix of programs and services to best meet their expectations. An Invitation Survey was mailed to 12,000 randomly selected households across the municipality. Approximately 500 were returned as undeliverable, meaning that about 11,500 households received the invitation to participate. A total of 1,097 invitation surveys were completed, which results in a response rate of 9.5%. Among those completed surveys, 980 (89%) were completed online, 48 were completed by telephone (4%), and 69 were completed by mail (6%). The margin of error for this study is of ± 2.9% (19 times out of 20 or at the 95% confidence level). In 2014, 592 invitation-based surveys were completed. Afterwards, an open survey, (identical to the invitation survey) was hosted by PRA Inc. In total, 1,567 respondents completed the open survey in whole or in part (compared to 1,087 in 2014). The results of the open survey cannot be considered as scientifically valid due to a lack of control over the sample and the possibility of residents completing multiple copies of the survey and impacting results, however results were similar to the invitation responses, and add value in understanding residents’ perception of municipal service delivery. Results from both surveys are available at www.halifax.ca/citizensurvey The summary report to HRM Council can be found at: www.halifax.ca/sites/default/files/documents/city-hall/regional-council/181113rc131.pdf The survey contained approximately 200 unique components across 67 questions, ranging in topics from quality of life, value for taxes, customer service satisfaction, satisfaction with and funding for services, community priorities, public safety, recreation and leisure, parks, public libraries, transportation, and key issues of focus for municipal leaders. Thanks to those who have participated in the process. Cole Harbour Heritage Farm Museum—$15,000 Memory Lane Heritage Village, Lake Charlotte—$20,000.